Modeling predicts "ocean acidification mitigation" | Watts Up With That? Modeling predicts "ocean acidification mitigation"
From the National Oceanography Centre (NOC), the Natural Environment Research Council (NERC), the University of Southampton, we have what looks to be a another Willis igniter. Emissions of carbon dioxide are causing ocean acidification as well as global warming. Scientists have previously used computer simulations to quantify how curbing of carbon dioxide emissions would mitigate climate impacts. New computer simulations have now examined the likely effects of mitigation scenarios on ocean acidification trends. They show that both the peak year of emissions and post-peak reduction rates influence how much ocean acidity increases by 2100. Changes in ocean pH over subsequent centuries will depend on how much the rate of carbon dioxide emissions can be reduced in the longer term. Largely as a result of human activities such as the burning of fossil fuels for energy and land-use changes such deforestation, the concentration of carbon dioxide in the atmosphere is now higher that it has been at any time over the last 800,000 years. Most scientists believe this increase in atmospheric carbon dioxide to be an important cause of global warming. “The oceans absorb around a third of carbon dioxide emissions, which helps limit global warming, but uptake of carbon dioxide by the oceans also increases their acidity, with potentially harmful effects on calcifying organisms such as corals and the ecosystems that they support,” explained Dr Toby Tyrrell of the University of Southampton’s School of Ocean and Earth Science (SOES) based at the National Oceanography Centre, Southampton. “Increased ocean acidification is also likely to affect the biogeochemistry of the oceans in ways that we do not as yet fully understand,” he added. It is widely recognised that carbon emissions need to be brought under control if the worst effects of global warming are to be avoided, but how quickly and to what extent would such mitigation measures ameliorate ocean acidification? To address these questions, Tyrrell and his colleagues, in collaboration with researchers at the Met Office, used computer models to quantify the likely response of ocean acidification to a range of carbon dioxide emission scenarios, including aggressive mitigation. Collectively, these models take into account ocean-atmosphere interactions (such as air-sea gas exchange), climate, ocean chemistry, and the complex feedbacks between them. “Our computer simulations allow us to predict what impact the timing and rapidity of emission reductions will have on future acidification, helping to inform policy makers” said Tyrrell. Global mean ocean surface pH has already decreased from around 8.2 in 1750 to 8.1 today (remember than a decrease in pH corresponds to an increase in acidity). The simulations suggest that global mean ocean pH could fall to between 7.7 and 7.8 by 2100 if carbon dioxide emissions are not controlled. “As far as we know, such a rate of change would be without precedent for millions of years, and a concern must be whether and how quickly organisms could adapt to such a rate of change after such a long period of relative stability in ocean pH,” said Tyrrell. However, if an aggressive emissions control scenario can be adopted, with emissions peaking in 2016 and reducing by 5% per year thereafter, the simulations suggest that mean surface ocean pH is unlikely to fall below 8.0 by 2100. But even that represents a large change in pH since the pre-industrial era. A clear message from the study is that substantial emission reductions need to occur as soon as possible and that further reductions after atmospheric carbon dioxide concentration peaks will be needed if ocean pH is to be stabilized. “Over the longer term, out to say 2500, the minimum pH will depend on just how far the annual rate of carbon dioxide emissions can be reduced to,” said Tyrrell. The researchers are Influence of mitigation policy on ocean acidification Dan Bernie (Met Office Hadley Centre, Exeter), Jason Lowe (Met Office Hadley Centre, University of Reading), and Toby Tyrrell and Oliver Legge (SOES). The research was supported by the UK Department of Energy and Climate Change (DECC), the Department for Environment, Food and Rural Affairs (DEFRA), and the European Community’s Seventh Framework Programme-funded projects EPOCA (European Project on Ocean Acidification) and MEECE (Marine Ecosystem Evolution in a Changing Environment). Bernie, D., Lowe, J., Tyrrell, T. & Legge, O. Influence of mitigation policy on ocean acidification, Geophys. Res. Lett., 37, L15704 (2010). doi:10.1029/2010GL043181. August 21, 2010 in Carbon dioxide, Oceans. Monterey Bay data shows a slight decrease in acidity, since they started taking measurements almost 15 years ago. And tell us how the pH was measured in 1750. Model construction requires many iterations which puts the outcomes in the hands of the modellers. Yup! This is the argument that the USEPA will use to slam in some nice carbon control regulations, count on it. Clean Water Act vs. Clean Air Act. We are already well into public comment time period for this. Get ready. New computer simulations have now examined the likely effects of mitigation scenarios on…. blah, blah, blah. I guess these guys are stuck between a rock and a hard place. As long as their computerized Ouija boards give them the predictions they want, the funding keeps rolling in. If, however, the predictions are too easy to debunk or if they are not disastrous enough the funding shrinks and the enforcers of doctrine descend upon them. pH of water in Danube river ranges between 7.8 – 8.5 during the year, sometimes from day to day.. call me unimpressed. Seriously, does the general public not know what pH 7.0 is? As far as this ridiculous article – covering the ‘CAGW mantra” from ‘ the CO2 increase is man’s fault, that most scientists agree it will cause warming, we MUST limits CO2 emissions or else’, I am a bit curious about how much CO2 would be required to change the PH from 8.1 to to 7.8? (any ‘ocean chemists’ that could provide an answer?). Just wondering . . .
“Computer simulation.” which are assumptions on how the oceans and atmosphere work and interact. Forgot to add, I can’t wait to see Willis’s comments on this . . ! Then life in the oceans should have gone extinct a long time ago, as sevaeral ages of intense vulcanism pumped C02 and S02 into the atmosphere in ginormous quantities, set the peat bogs and coal beds on fire, and choked the planet in a Gortoxic sludge. Helping themselves to the piles of cash, for supporting the enforcement of energy denial upon the citizens who will now be known as neo-serfs. This isn’t about saving the planet, it’s about creating the Ultra-Elite, or so they think. What happens after the success of the political agenda? The knowledge base that empowers challenge to the new power is liquidated. This is an exciting time for life. Will it adapt, or fall on its face and die? Or will it just not notice? And what about mankind? What will we do if nearly all sushi restaurants close for a lack of fish (except for a few very expensive ones that cultivate fish in tanks, obviously)? Eat something else? Adapt? Die? Lots of “good” material in here for you to study! I expect a lame-duck session action in Congress to do something about all this (large point-source contributors of carbon dioxide will be regulated, ex. power plants, other industry). My industrial clients inform me that they are gearing up for this in a big way, EPA carbon regulation seems unstoppable at this point. Crying won’t help, get ready…. The EPA is carrying out orders that are reactionary. It’s a reaction to the rejection in the Senate of Waxman-Markey, by order of the Chief. A policy threat is held to the head of the recovery. Pass the crippling tax, or the economy gets it. There will be no new jobs until they get thier ransom price… is inferred. Therefore, the economy is the hostage. Well, does the nation cave in to such demands? Those darn computer models! They are NOT science and mean little more than the wet-dreams of the programmers! Real world studies of the oceans show that there can be wide fluctuations in pH during the course of a day and always towards higher pH. A little “acidification” (pH 7.6 is still basic) would lessen the tendency of photosynthesis to make seawater alkaline (up to pH 10+). Seawater is a complex buffer which would be difficult to overcome. Also, protons released by the formation of carbonic acid cannot affect the solubility of calcium carbonate as it is part of an extended equilibrium from CO2 to calcium carbonate and cannot affect itself. Only an outside source of protons, such as from sulfuric acid produced by SO3 dissolving in the seawater, could affect the equilibrium. This is pretty basic chemistry, but obviously way above the heads of the programmers. Yet another zombie scare story drags itself upright and shambles towards us, horny hands reaching out, only to be met by the same silver bullets that made it bite the dust last time. C’mon modelers! Is that the best you can do? Why not dust down “CO2 abducted my Grandma” or “CO2 causes ED” and try with one of those? The amount of grant money you are milking from taxpayers, you might have thought one of you could come up with something (a) plausible and (b) which a reasonably bright ten year old couldn’t debunk. Even Bob Ward wouldn’t believe this crap. Sensationalist theories are generated by scientists who have evolved into professional alarmists who can influence the IPCC and reap rich rewards in research grants and fame. The trouble is that the only way to protect this position – and transmit their message of doom and gloom – is for the little coterie of élite climate comrades in the UK and United States to ignore geology, archeology, history, astronomy and solar science. You see, these are all the things that don’t fit. Five of the Earth’s ice ages saw a far higher atmospheric carbon-dioxide content than at present. So carbon dioxide could not have caused past climate changes. Indeed, early Earth had 1,000 times more carbon dioxide in the atmosphere than now – yet there was no runaway “greenhouse” effect, “tipping points” or “acid oceans”. Dissolving carbon dioxide in ocean water has not created ocean acidity. The constant chemical reactions between ocean water and sediments and rocks on the sea floor have kept the oceans alkaline. When we run out of rocks on the sea floor, then the oceans might become acid. I’m not holding my breath. Why is this story contrary to what we hear? Because sensationalism is so much more lucrative. A climate catastrophe was provided for an anxious public by scientists who had everything to gain by frightening us. They put forward an ideology that is blind fundamentalism, unrelated to scientific facts. Politicians build new bureaucracies and pose as environmental saviors knowing that they will never have to face the consequences of their actions. I may be misreading the chart, but it looks like a slight decrease in pH to me – i.e. a slight INCREASE in acidity (or decrease in alkalinity if you prefer). (remember than a decrease in pH corresponds to an increase in acidity). This is the ultimate non-scientific statement. How in hells name can reduced pH 8.2 to 8.1 be an increase in acidity. Complete buffoons. <7 =alkaline< 7 = acidic. Idiots, idiots, idiots. This is another case of teasing a trend out of noisy data in which the supposed trend is smaller than measurment precision and accuracy; and normal variability is many times greater. So humanity doesn’t count as ‘life’? Are you there David Cameron? Sacking this lot of childish idiots will help the structural deficit. Politically driven drivel of the worst kind. I cannot believe that most people will be gullible enough to fall for this nonsense. This sentence alone is a dead giveaway. Some time ago climate progress had a big rant on catastrophic ocean acidification. I asked what the Ph was and my question was deleted. Corals evolved during the Cambrian, with CO2 at 4000 ppm. The properties of Aragonite have not changed. We don’t know what is going on but we know bad things will happen. Sounds like superstition to me. How does a proton know if it came from carbonic acid or sulphuric acid? Wow. That’s a big number and a long time. Sure impresses a guy like me who cannot remember what he had for breakfast this morning. So they are trying to say the ocean would run out of alkalinity/buffer. When you titrate sea water, that end point is ~4pH. Bicarbonate is what corals, etc use. What they are not explaining, is they are worried about Ca and Carbonate being in solution. The higher the pH, the lower the solubility of calcium carbonate. A falling pH increases the amount of calcium and alkalinity that can be kept in solution. Animals that use Ca for structure get around all of this by using their symbiotic algae/dinos to raise their pH internally, causing Ca precipitation. Which explains why these animals have been around as long as they have, and their whole worry about the oceans getting a tad less alkaline is way off. Someone please tell me, how the echinoderms could possibly survive during the Paleocene and Eocene, when CO2-levels in the atmosphere and, hence, in the ocheans, were 5 (FIVE!) to 10 (TEN!) times higher than today, if an additional “acidification” of around 5 percent today was poised to have already devastating effects on them? The kind of hubris expressed by these authors diminishes any real science they may have been doing and reporting on. Someone once said a little knowledge is dangerous. This paper and others like it exemplify that. When it comes to the oceans we are so ignorant that all we have is a very little knowledge. I strongly suspect that makes all of us dangerous when we make pronouncements about the unknown. On the other hand, perhaps it makes us good fiction writers. You are right. The sea water can not be considered to be a pure water. It acts as a chemical buffer with it’s limited capacity. This is a basic requirement for life in a long time needed for the evolution. No wonder the UK Met is up for sale! They can, but you should more accurately always refer to it as decreasing alkalinity. A man is subject to errors. But, if you want to really screw things up, you need a computer! Excerpt from the American Declaration of Independence, by Thomas Jefferson. I find this ridiculous on it’s face. 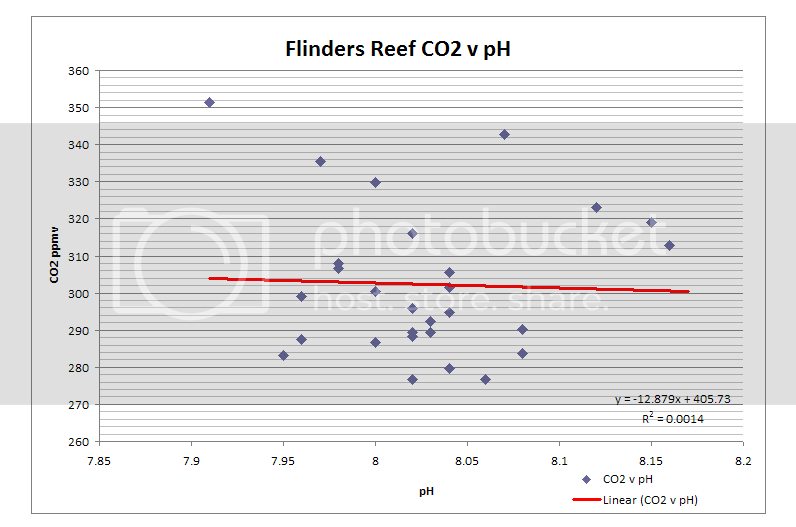 CO2 concentration has only changed by what 80 ppm? roughly 25%? pH is logarithmic. Oceans have a natural buffering mechanism (various salts). Natural variations predominate. Accurate measurement of pH is what…maybe 100years old. I’m going to start a movement and every time someone comes up with this stuff, we are going to scream, “You must be f-ing s-ing me”! REPLY: RB, the USEPA is under the authority of the POTUS (executive branch). They make the regulation, he signs it, end of discussion. US Supreme Court gave them all the ammunition they need. The nation has already caved into such demands, sir. (or, madam?? My “C” is for “Chuck the DrPH!”). It is just a matter of time. SCOTUS is already more liberal, likely to become even more so. Cap & trade? Don’t need it. They will follow the NPDES model of the Clean Water Act. “a decrease in pH corresponds to an increase in acidity”…..surely it would be more correct to say it corresponds to a decrease in alkalinity.Words matter. An uncritical reader might conclude the oceans were allready acid. There have been numerous studies done on the ocean acidification issue without relying on models. Many, if not most, have found the acidification “issue” to be a non-issue. Obviously, marine life has thrived under conditions of much higher CO2 ppm levels and “acidification” will not likely be a threat. No, it depends on the buffering capacity of all the limestone in the seas. A pH change from 8.2 to 8.1? So, what? The pH changes in my reef tank from 8.3/8.4 to 8.0/8.1 and back again every day. Depends on the time of day I take the measurement (have I fed recently, is it the night cycle, day cycle, have I dosed recently). Good point. As the oceans are becoming more ‘acidic’ how will they be classified if they were to reach PH 7.0? Very acidic? Of course, it is pertinent to ask the question of whether organisms can deal with a rapid and comprehensive change in the PH level, whether alkaline or acidic. So, in reality there are several questions here. Can organisms deal with a less alkaline ocean? Can organisms deal with a neutral PH ocean? Can organisms deal with rapid changes in PH level? What happened to organisms in the past when CO2 levels exceeded today’s and were the oceans acidic or alkaline? Not as oceanic life, no. Humas are a mostly terrestrial form of life. They have no gills. Stephen, think estuary. (rain/acid, wind/mixing, phyto, etc) all things that rapidly change pH. Yet even closed estuaries, with very little water volume, have remarkably stable pH. It goes right back. and most sea animals choose estuaries to raise their young….. I would like to see what information they put into their ‘model’. They obviously missed some very important things. We have a nick-name for them. We call them “coats”. They graduate from some university, and think they are going to get to wear their little white coats all day. Not a one of them has one lick of common sense. We tell them we’re got to find out what manatees eat, hand them a 5gal bucket, and tell them to have at it. What they need to take in school is how to overhaul an Evinrude. Now there they could make a living. We all know that phytoplankton increase pH, directly and indirectly by the uptake of inorganic carbon. Anthony, posted a “study” showing that phyto levels have decreased. Ignoring the whole CO2 nonsense, both of these could easily be explained as the nutrient levels in the ocean have decreased. Supporting less phyto. Which could mean the oceans are releasing more CO2. Which could also mean the oceans have gotten cleaner. It takes a dirty ocean to take up a lot of CO2. Chicken Little, meet your competition for panic story of the millennium. That the sky could fall is actually more possible than the oceans becoming acidic, let alone “more” acidic. What is the ph of carbonated mineral water? That should be “a slight decrease in alkalinity”? That is what the graph shows. 1. “Global mean ocean surface pH has already decreased from around 8.2 in 1750 to 8.1 today (remember than a decrease in pH corresponds to an increase in acidity)” Pur-lease! Who was measuring global pH in the oceans in 1750? 2. CO2 in water forms carbonic acid, the weakest of all acids – it’s soda water! Volume of oceans = 1.31 billion cubic kilometres, or 1.31 billion billion tonnes. one part in 4,761, 905. This figure is around double the amount of CO2 actually being absorbed by the oceans each year, the rest stays in the atmosphere.. Put another way: over a century, the oceans’ concentration of CO2 will increase by one part in 47,612. In reality, the actual figure would be about one part in 100,000 per century. The numbers are clear: the effect of CO2 absorbtion in the oceans is far too tiny to be of any consequence whatsoever. Even if all the CO2 was absorbed by the uppermost 10% of the ocean, the increase would only be around one part in 10,000 per century. The term ‘climate scientist’ is clearly inappropriate and misleading, better ones might be: i) climate astrologist, ii) climate scientologist, iii) professional grant procurer, iv) scare mongerer for personal profit, or v) scam artist. “Not as oceanic life, no. Humas(sic) are a mostly terrestrial form of life. They have no gills. DirkH whales don’t have gills either, so I guess that makes them “a terrestrial form of life” too. That would explain the mass strandings of whales that occur every year in NZ. They are just trying to get home(on terra firma) but get stuck in the sand before they get to terra proper? Alright so the Ocean is 8.1 more or less, and Neutral is 7.0, so acids are less than 7.0. What would it take to make the ocean become less than 7.0 pH? Did the fellow mention that? I got bored with the story. I find these research papers puzzling. How do they know what the pH of the oceans was in 1750? For that matter, how do they know what the “global mean ocean surface pH” is today? Did they calculate a global mean ocean surface pH from an assumed DIC which was estimated from atmospheric CO2? I’ll bet a beer that they did. Flinders Reef may only be a tiny little reef in the middle of the Great Barrier Reef system, but Pelejero et al. were decent enough to derive a historical ocean surface pH from boron isotopes. Pelejero’s excellent geochemical data set is available in NOAA’s paleoclimatology library. That’s because oceanic pH doesn’t change a whole lot in response to changes in atmospheric CO2. The low pH levels from 60 mya to 40 mya include the infamous Paleocene-Eocene Thermal Maximum (PETM); a period in which large scale subaerial and submarine flood basalt eruptions probably dislodged a massive volume of methane hydrates into the Atlantic Ocean, causing a shoaling of the lysocline (AKA ocean acidification). Even then, the oceans did not actually “acidify;” the lowest pH was 7.42 (still basic). PETM CO2 levels have been estimated to have been 1000 to 3000 ppmv from pedogenic carbonates… But fossil plant stomata suggest that CO2 levels in North America were not much different than today (300 to 400 ppmv). IMHO, the good Dr. needs to take smaller bites. Global warming, and ocean acidification, all in one sweeping statement is a bit much to digest. These guys are nuts! There is no way to do what they describe above without literally taking control of the world and imposing marshall law. Of course, that’s what they want, so would we expect to hear anything different? They HAVE to yell louder and more and more shrilly because they know that the world is catching on to the fact that (1) manmade global warming is false and (2) the climate is cooling, not warming, despite their junk science claims and the fact that CO2 is continuing to rise quite steadily. Did the back of the envelope sums on the annual anthropogenic CO2 mass and the ocean volumes a few months ago. Mass the releases of annual anthropogenic CO2 = mass of just over 2 cubic kilometres of sea water. Only if… the inputs are accurate, the program is 100% bang on and no homogeneous adjustments are made. “This is the ultimate non-scientific statement. How in hells name can reduced pH 8.2 to 8.1 be an increase in acidity. Complete buffoons. <7 =alkaline< 7 = acidic. Idiots, idiots, idiots." So, a move from a pH of 8.2 to 8.1 is an “increase” in acidity though it is a loss in pH. Or did I misunderstand what you were trying to say? Sorry, folks, this is the sucker-punch from the EPA that I’ve long been waiting for. While Mann etc. have been focused on catastrophic temperature increases & all that blather, the chemists at EPA (some damned good ones over there) have been quietly researching this and gathering their evidence. With the utter collapse of the “Arctic Ice Death-Spiral Theory” and other CAGW hoo-hah, I expect you’ll be hearing a lot more about oceanic acidification in the near future. Too bad that Mann, Jones etc. don’t have the right credentials to conduct & publish research in this realm! They put all their chips on atmospheric & meteorologic catastrophe. Poor climatalogists, now they’ll have to re-train as saltwater chemists & marine biologists! This is complete and utter BS. Volcano emissions have increased above sea level. …and some estimates of young seafloor volcanoes exceed a million. The lowest pH values are all on the left half of the chart. It was more acidic in the past. Real world studies of the oceans show that there can be wide fluctuations in pH during the course of a day and always towards higher pH. Thus a difference of 0.1pH between two readings, taken 220 years apart, is meaningless. Even before considering accuracy of either reading. Seawater is a complex buffer which would be difficult to overcome. Also, protons released by the formation of carbonic acid cannot affect the solubility of calcium carbonate as it is part of an extended equilibrium from CO2 to calcium carbonate and cannot affect itself. Only an outside source of protons, such as from sulfuric acid produced by SO3 dissolving in the seawater, could affect the equilibrium. Such sources do exist, undersea volcanic vents can apparently go as pH 2.8. This is pretty basic chemistry, but obviously way above the heads of the programmers. Another example of the march for further funding. Amplify the scare!!! These scientists have no knowledge of geological history. During times of high atmospheric CO2 content, like the Ordovician or the Cretaceous coral growth was at its highest. In fact they really flourished. 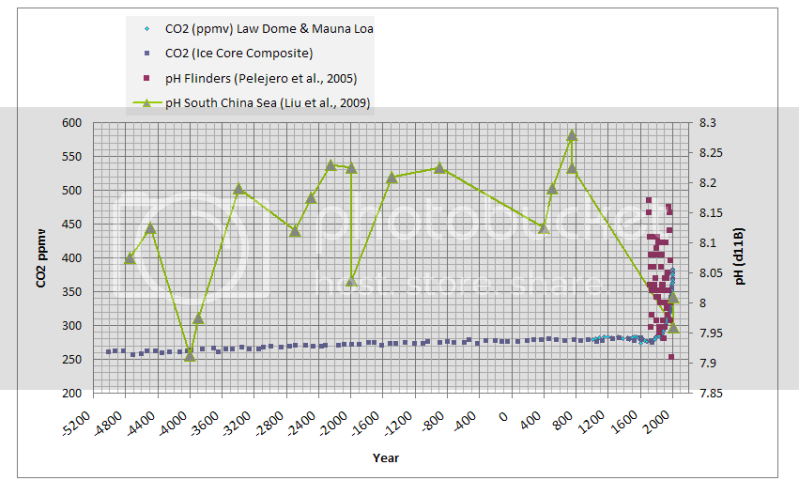 Corals seem to love CO2 and when the real ocean chemistry is studied it is obvious why. It is the bicarbonate feedback which provides the compound required for shell growth and raises the pH. pH studies, which have not actually covered the total ocean content, is shown to vary from 7.9 to 8.3 naturally. Worries that 7.9 is acidifying the water is total alarmism since 7.9 is still alkali. It must also be remembered that it is the Southampton University scientists who, whilst carrying out studies into coral dissolution due to CO2 content, included hydrochloric acid into the mix to ensure that the corals actually dissolved. They could not get CO2 alone to do this. one part in 4,761, 905. Two huge errors here. First, you are assuming that the oceans are well mixed. There’s not. Most of the ocean has a mixed layer depth of less than 100m. On policy relevant time scales it is the acidification of this surface layer that is relevant. Second, it is the cumulative emissions that are a cause for concern, not one year’s of emissions. If you don’t like it, don’t write it. Basically its just another scam. So, instead of being afraid of more Heat in the Pipeline, it seems that what ordinary people needs to be educated about, is all the Scams in the Pipeline. It seems to be a Pipeline filled up with never ending Scams. Someone ( the Government and the Coorporations) wants a straw into your pocket, so the can drain your assets continously. This is such a straw. a move from a pH of 8.2 to 8.1 is an “increase” in acidity though it is a loss in pH. Or did I misunderstand what you were trying to say? Let’s say I take an elevator from the 12th floor to the 11th. Would it be proper to call that an increase in my subterranean-ness or my underwater-ness? No. Therefore the term used ought to be oceanic “neutralization,” not “acidification,” given that the ocean is never going to get below the neutral level. The fact that “acidification” is being used is a giveaway that the alarmists are framing the issue. Now we need some credible souls in the appropriate scientific fields to independently validate these findings over the course of the next 50 years. I don’t think it’s going to happen, but.. who knows? I know I’m being nieve about all this but human history reveals that humans are more lemming-like than lemmings and it’s one thing to claim and prove that such-‘n-such is true, and an altogether other thing to do something about it. Not an apples and oranges comparison in my opinion, but a molehill and mountain type of thing –’tis very easy to ‘prove’ something, ’tis another kettle of fish to ‘do’ anything. Wake me up when everyone starts jumping off the cliff. The Monterey Bay ph data clearly needs to be corrected, as the NZ and Aussie temperature records (and so much else) have been. The key line is at the bottom of the report, who funded it. He who pays the piper calls the tune. There is another 1.9 billion euros worth of funding alarmist science heading down the pipes in EU framework 7 alone. It is a reasonable assumption that all this funding will go to the consensus of catastrophists. It pays to conform. I love this fascination with computer modelling. It is admission from the global warming alarmists and the IPCC that their case is mute. Otherwise, they would be using actual data to back up their claims. I love the myopia of alarmists. They are horrified by surface temperatures rising, but ignore or are oblivious to falling temperatures in the Lower Stratosphere, and the cooling of the Thermosphere by rising CO2! I love the WUWT photos of air conditioners, concrete, asphalt, etc., encroaching on the GHCN temperature measurement stations; the closing of stations in upper latitudes; the 1,200-km radius “smoothing” over missing stations; the corruption of the historical temperature records. 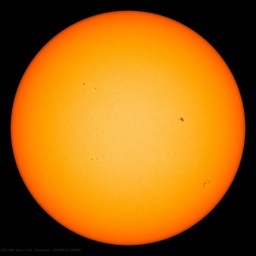 Twenty years from now when we are deep within the Grand Solar Minimum, freezing our butts off, all this agw alarmism will be a distant memory. The only fear I have is: how much damage will these alarmists and politicians have inflicted on society? How many trillions of dollars will have been stolen from taxpayers and wasted examining and attempting to fix a non-problem? And who is benefitting from this continued charade? The people overwrought about changes in ocean pH and climate change have created the mythology the earth’s systems have a steady state that have dangerously deviated because of humanity’s sins. Though we like to think superstition and witchcraft have vanished in our age of widespread education and scientific enlightenment, it appears a large percentage of people are all to ready to embrace the supernatural and hand over their autonomy to the high priests of the new religion of climate science. I wonder when the burnings of the heretics will begin. Oh, wait a minute, there are already calls for retribution and punishment for the skeptics. 1. Is the ocean acidic at the moment? 2. Has the ocean been acidic in the last 60 million years? I assume the answer would be “no” in both cases, and that anyone who says “yes” is wrong. Are there records for other oceans for 60 million years? At 25ºC, it varies with temperature, neutral pH is greater than 7 for temperatures below 25ºC. For most of the ocean neutral pH is above 7. Just imagine the headlines you would see if the research talked about increasing CO2 reducing the alkalinity of the ocean, bringing them closer to neutrality. I suspect there would be no headlines, because it sounds positively beneficial. Gone are the visions of sea shells bubbling away as their shell are dissolved in acid seawater. Gone are the memories of acid rain dissolving Scandinavia (I lived there in the 80s and it didn’t seem to have dissolved then). Instead, the ocean is moving to a state where it is less chemically aggressive. Now who could worry about that? Once again the spin-meisters are doing their stuff by the use of loaded phrases designed to trigger the requisite emotions in large sections of the non-scientific, green-leaning and environmentally gullible public. It is truly amazing what you can do with a few carefully chosen words. No it’s a sign that chemists who know what they’re talking about wrote the report. Acidification refers to an increase in the [H+], in this case we’re talking about a ~25% increase in the [H+]. It is not proper to refer to ‘alkalinity’ in reference to seawater in this context as some here have done as it has a different meaning. Not only that. The deep ocean bottoms are basaltic. Basalt is alkaline. The oceans are an alkaline liquid in an alkaline container. No way they could ever become acid, or even neutral for that matter except very locally, for example around volcanic vents (which incidentally teem with life). It puts evolutionary and marine biology under the gun to say how fast ocean life of various flavors can adapt to pH change. Good luck there. I’m predicting that with the insanely large numbers of individual fast reproducing critters involved, and recent geologic history of lower pH ocean, and extant adaptations to wide pH range that this is a non-problem. Natural selection working on large number of individiuals of many species and sub-species changing allele frequency in the populations in response to changing environment is exactly what Darwinian evolution does for a living and it’s pretty good at it. Except, I guess, when it’s politically inconvenient for it to work as advertised. Note all the weasel words like “could” “might” “may” “possibly” and so forth. And the obligatory demand to stop human CO2 emission of course. Unsurprisingly it ends with (paraphrased) “please send money”. Perhaps a sign that environmental chemists wrote the report. But certainly, the more general use of the term “acidification” among chemists and non-chemists alike is just as most on this thread are using it…to become acid. The link shows “acidification” being used to “become less basic” is almost exclusively used in the environmental field. Most other uses refer to “becoming acid”. You might like this one in particular. And your distinction about “alkalinity” as far as being meaningful to the discussion on this thread is a distinction without a difference. In fact, some on this thread are using alkalinity in a perfectly correct sense, and those that aren’t can simply replace the word “alkalinity” with “basicity” and move right along with their lives. Not to anyone who understands the chemistry. Gone are the visions of sea shells bubbling away as their shell are dissolved in acid seawater. Why, the solubility product of aragonite depends on [CO3–] which goes down by a factor of two+ regardless of what you call the change? Gone are the memories of acid rain dissolving Scandinavia (I lived there in the 80s and it didn’t seem to have dissolved then). Again why, rainwater in equilibrium with CO2 at present levels has a pH of 5, in industrial/urban areas it can be significantly lower than that, approximately as acidic as vinegar. Instead, the ocean is moving to a state where it is less chemically aggressive. Now who could worry about that? Moving towards ‘neutrality’ is not ‘less chemically aggressive’ for most of the lifeforms that live in the ocean. Your inaccurate choice of nomenclature would actually lead to a false sense of security among the public at large. You should look up the Permian Extinction when ~95% of marine species became extinct, the worst hit were those that produced calcium carbonate skeletons. Phil, chemists have a really hard time describing what goes on in the real world. They have all that biology in the way that they don’t understand. Corals, echinoderms & coccolithophores ain’t nearly as huggable as poor, starving polar bears huddled onto a shrinking ice-cube of a floe, but this is the ammunition EPA will use to slam home Clean Water Act regulations on GHG emissions. Now, the Chinese & Indians ain’t participating, so we will shoot our industries in the feet and put ourselves at a global competitive disadvantage…don’t say I didn’t warn you. Gosh Phil, I wish I was clever like you. I stand corrected even though I don’t understand most of your correction. So you see, like most of the public I don’t understand chemistry to the extent that you obviously do. I was talking about the impression I get from the phrase “acidification of the oceans” and also from “acid rain”, and I suspect I am not alone in that. Scientists need to understand that the public can easily misinterpret what they say, on a whole range of levels (probability, effect, timescales etc) and react in a variety of ways, both rational and irrational. To give you an example of what this can do, I cite the case in a radio phone-in on BBC radio 4 a few weeks ago, on the subject of climate change, where a woman phoned who was almost in tears because no-one had come to the same conclusion as her that women should no longer have children because it would be unfair to bring them into a warmed world. This woman genuinely believed that the UK would be unsuitabe for children as a consequence of global warming. So I took your advice and looked up Permian Extinction, and what I found was that ocean acidification was one of a number of possible causes of the extinction of marine species – so back to my point, there is no certainty here despite you presenting me with information which gave me the impression were facts. What is also clear is that although this was catastrophic for individual species, life did not cease on Earth. The human race ultimately developed, and arguably it may not have done if the Permian Extinction hadn’t happened. What I also learned was that this extinction wasn’t unique, and others had occurred earlier, all with the same end result, recovery. So what makes you think that every species has a right to survive, and I include mankind in this. The history of this planet is one of the rise and fall of species of all types, adaption to changing environments, but throughout it all, continuation of life on the planet. Sounds like a pretty positive outcome to me. Acidification refers to an increase in the [H+], in this case we’re talking about a ~25% increase in the [H+]. 1. The use of “already,” which implies an ongoing process that is leading rapidly to more of a decrease in pH. 2. The erroneous parenthetical statement that decreased pH equals increased acidity, delivered as if aimed at little kiddies. By this one statement alone we can infer that the authors are aiming their declarations at children, and intend to convey a sense of urgency. Hey kids, your parents and other old people (or even worse, dead people!) have left you with this really messed up planet, and you need to join the fascist youth party to add your uninformed voice to the propagenda(TM) war. Not sure if anyone is still reading this, but I corresponded with Jo Nova on this a few months ago. I promised her some references. A pretty good one came out a little later, so I bought it from Science. I’ve put it in FileDropper if anyone wants to read it. It does a pretty good job of clarifying the “acidification” term. “Two huge errors here. First, you are assuming that the oceans are well mixed. There’s not. Most of the ocean has a mixed layer depth of less than 100m. On policy relevant time scales it is the acidification of this surface layer that is relevant. Second, it is the cumulative emissions that are a cause for concern, not one year’s of emissions. In a single instant of time, the oceans do not mix well. Over days, weeks, months or years, there is constant mixing through a variety of currents right down to the abyssal depths. Ocean currents are everywhere, if they weren’t, life could not exist at all levels in the oceans. Also, I used figures for a century to make my point and then assumed all the CO2 was absorbed by just 10% of the ocean to further make my point, which is: scare stories about CO2 acidification of the oceans are baseless and an obvious hoax to anyone with the slightest bit of scientific sense. If the oceans aren’t well mixed, how come they are oxygenated everywhere, at every depth? That oxygen can only have come from the atmosphere, or from photosynthesizing organisms up in the photic zone. And apparently the mixing is fast enough that there is never time for the organisms in the sea to use the oxygen up. OK there is one exception: the Black Sea, where major fresh-water influx from several large rivers, and an almost non-existent connection with other oceans means that a stable stratification is possible. The oceans aren’t well mixed and certainly aren’t ‘oxygenated everywhere, at every depth’. On average the oxygen concentration drops from saturation at the surface to a minimum around ~1000m depth, the depletion is caused by organic detritus being oxidised on the way down. That’s mostly used up by that level and the deep water oxygen levels are rather higher due to deep ocean currents. Check out the “Oxygen minimum zone”. Charles Higley (August 21, 2010 at 12:34 pm) pointed out what I believe to be the most important problem that those who predict that increasing carbon dioxide concentration in the ocean causes acidification and that the acidification will increase the solubility of calcium carbonate. It seems to me that increasing carbon dioxide will increase the concentration of carbonate ion which will result in calcium carbonate becoming less soluble and therefore easier to precipitate. Is this not the result of a solubility product constant calculation? The excess protons generated are not significant, the product of the calcium ion concentration times the carbonate ion concentration is a constant. You can increase the solubility of calcium carbonate by using a mineral acid (HCl, eg) to decrease the pH, but what that does is reduce the concentration of carbonate (see the pretty bubbles) which allows an increase in calcium ion concentration, i.e. dissolution of calcium carbonate. A change from pH 8.2 in 1790 to 8.1 in 2010 is a change in H+ concentration (in moles per liter) from 6 x 10 exp -9 to 7 x 10 exp -9, or a change of 1 x 10 exp -9. If it goes to 7.8 by 2100 (not that I am stipulating that) the new concentration will be 15 x 10 exp -9, or roughly twice the H+ concentration. So, yes, would be an addition of acid, but these pHs are all still in the alkaline range. I would expect life can handle such slight shifts in pH. As to if these pHs will actually happen, the calcium/bicarbonate/carbonate/CO2 system is known as a “buffer”, that is it can absorb acidic contributions with little change in pH due to reserve alkalinity, like it is in the oceans. More calculations to follow…..
And pray, where does that oxygenated deep water come from unless the oceans are well mixed? You know the answer as well as I do; from the surface in the North Atlantic and the Southern Ocean. Charles Higley (August 21, 2010 at 12:34 pm) pointed out what I believe to be the most important problem that those who predict that increasing carbon dioxide concentration in the ocean causes acidification and that the acidification will increase the solubility of calcium carbonate. It seems to me that increasing carbon dioxide will increase the concentration of carbonate ion which will result in calcium carbonate becoming less soluble and therefore easier to precipitate. Is this not the result of a solubility product constant calculation? You are missing the bicarbonate ion equilibria, increase of CO2 in the atmosphere leads to a shift to bicarbonate and a reduction in carbonate ion. Under current conditions the majority of the carbon in the ocean is in the form of bicarbonate ion. Carbon dioxide enters the water in its gaseous form. The first step is formation of a complex between one water molecule and one carbon dioxide molecule, H2CO3. The first dissociation is to H+ and HCO3-. Then on to another H+ and CO32-. If you add a mineral acid, you can drive the reaction back to H2CO3, and drive carbon dioxide back to the atmosphere. The mineral acid forces the first step back to gaseous carbon dioxide, which allows calcium carbonate to enter the liquid solution. However, the hydronium ions that the dissociation liberates as carbon dioxide becomes carbonate cannot cause the carbon dioxide to reform and leave the solution. Higher acid concentrations will mean more species migrate to different, deeper or shallower locations in the ocean and so it will greatly effect the food chain.